Tensions on the rise, again! Emotive outbursts may be part of this looming full moon. U.S. Department of Defence (DoD) reported on Wednesday May 18, 2016, two mainland Chinese tactical aircraft intercepted an American reconnaissance plane in an "unsafe" manner. China's external affairs agency spokesman Hong Lei said on Thursday the description was "untrue." Two Chinese J-11 fighter aircraft pursued a U.S. EP-3 reconnaissance plan as it "flew close" to the island province of Hainan, he said, but kept "a safe distance" and did not make "dangerous moves." China reported the U.S. flights were a "severe threat" to Chinese security, calling for Washington to stop them immediately. Transiting Jupiter on the move. After 121 days of reflections the guru is once again taking control. Zeus is attending to matters that were unresolved during his leisure time. Justice is number one on the list. Coupled with Mercury - Mercury/Jupiter - Court of Arbitration -Contestation relating to matters of Justice, Fairness, Righteousness, Integrity, Injustice. China has an interest in the Earth affairs of this "Year of the Fire Monkey". Mercury the lord of China's natal Saturn and MC, makes three retrogrades in the earth signs Aquarius/Capricorn - Taurus -and Virgo) in 2016. On January 5, 2016 Mercury first Stationed RX at 1 degrees Aquarius, this station was on China's natal Moon forth house(land). RX Mercury then moved back through Capricorn. Around the same time Jupiter Stationed and retrograded for 121 days at 23 Virgo, and on May 9th 2016, Jupiter Stationed Direct at 13 Virgo. China has natal Saturn at 13 Virgo, natal Jupiter at 23 Capricorn and natal Descendant, 24 Taurus. 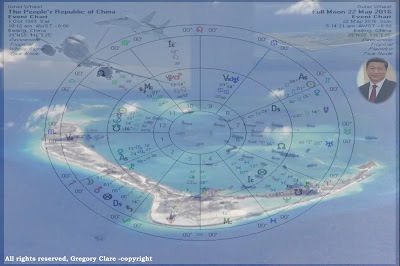 So at present transiting Jupiter is co-joined to China's natal Saturn - 13 Virgo, conjunct the MC - 7 Virgo, of the Zhisui Li chart (10:13am - Oct 1, 1949 -copyright Gregory Clare Mountain Astrologer Dec, 2012/13). Jupiter/Saturn in Virgo may create emotive nervousness and a lack of patience and contestation over possessions. Add to this transiting Mercury - Mercury Stationed RX at 23 Taurus, on April 28, 2016. 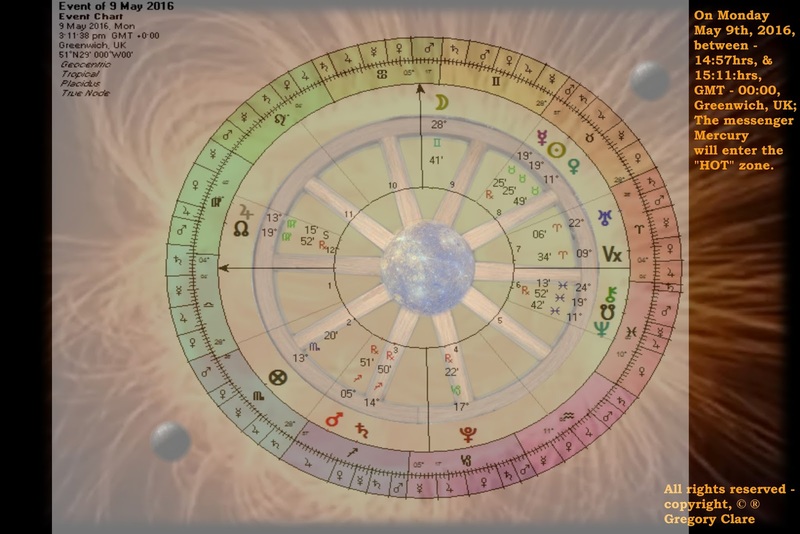 Mercury is on this full Moon May 21/22, 2016, Stationing DR at 14, Taurus. 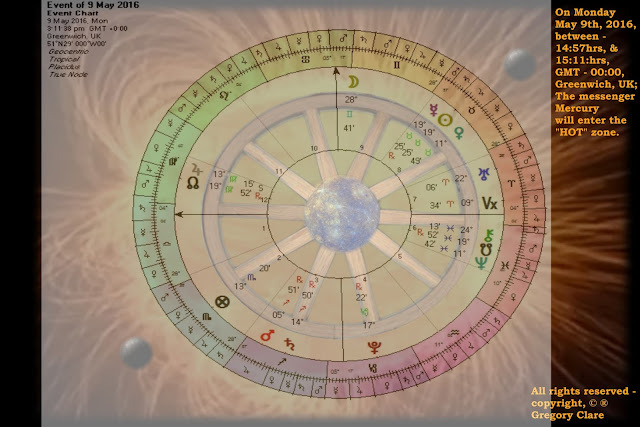 Furthermore on August 30, 2016, Mercury will Station RX at 29 Virgo, and will travel backwards through Virgo and Station DR on Sept, 22, 2016 at 14 Virgo. This is an astronomical cosmic dance highlighting China's natal Saturn and Jupiter. The consequences of this prominence of Earth is an accent on the 7 house matters, astrologically reflected through communication with Others, and seen through the Eyes of the natal MC, the World illumination! Mercury the messenger of Ra enters the final stage of its "Alchemical" transformation. On Monday 9th May, 2016, between 14:57hrs, and15:11:37hrs, GMT -00:00, Greenwich, UK; The messenger will enter the HOT zone. Mercury's transit between Earth and Sun will see the planet cross the Heart of the Sun, (Cazimi). This very rare event marks a point in Mercury's very eccentric orbit. The transit across the Sun commences @ 11:12hrs, GMT, and finishes @ 18:42hrs GMT. Mercury will enter 00:00 latitude as projected onto the ecliptic. This means the planet will be at its Central Node point, North and South Node intersection. Mercury's ascending node is 19 degrees Taurus, and the descending node is 20 degrees Taurus. This is very significant; WHY? Mars has an ascending node at 19 degrees Taurus. The astronomical - astrological cosmic expression of this is a node conjunction. The joining of the two planetary node's will manifest as Mercury/Mars encounters. This embodiment will vary with regards to gender, for feminine encounters it may mark the entry or re-entry of male persons or activate or re-activate powerful thoughts. And for masculine encounters it may mark the entry or re-entry of conflicts or power struggles or contestations. These contestations will have a quickening and excitability attached to them. It is a time to re-remember, think before acting. Powerful achievement can come from this encounter, however "Stillness" is the moment, although, quickness will be the "Force". The planet moves from a representative of the Solar team to join the Lunar team. However the planet does not behave as the other planets do with regards to Sect allotment. Because it will now begin a new phase of rising diurnally behind the Sun, which is described as Vespertine - of, relating to, or occurring in the evening: "stillness" opposed to "Action". Mercury's orbital eccentricity see's the planet cross the face of the Sun on the ecliptic every 7.4 years. However like Venus (the other inferior planet), Mercury's transits across the face of Ra occurs in clump's. Another peculiarity astronomically is that the planetary node meetings between Mercury and Ra only happen in May or November. Since its orbital inclination is tilted at 7degrees relative to the Earth, only once every 23 times Mercury's passing between the Sun and the Earth eventuates to a transit. The last encounter occurred in November 8, 2006. NOW here's the spooky part - the well oiled cosmic wheel makes for some strange theatrical production; on November 8th, 2006, the Moon on this transit was also in the same degree of Gemini. I mention this as Mercury is the lord of Gemini. And with regards to the events happening in the world - Gemini's are in the spotlight. There is much, much more to this "Transit -Event", but for now that's my story thus far.